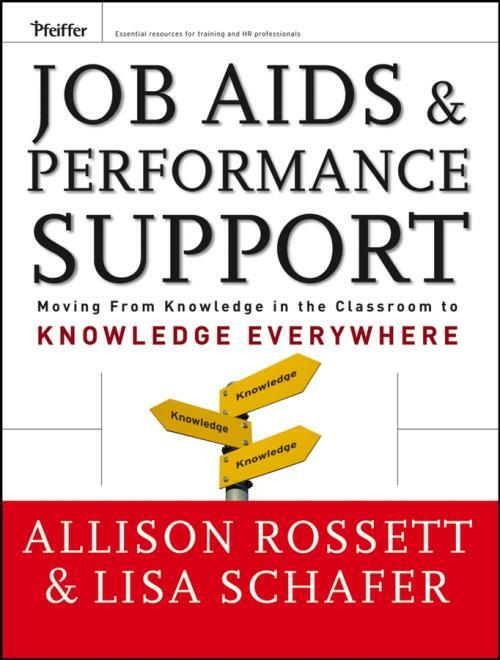 "Allison Rossett shines her spotlight on performance support through job aids, low and high tech, available now and coming soon. She and co–author Lisa Schafer dazzle us with possibilities for Planners (for just before and after the performance challenge) and Sidekicks (great term! for what to do right now). Lively language, wide–ranging examples, and cautions about possible dark sides make this book an invaluable sidekick for performance–focused professionals." "This is PS, performance support that isn′t always electronic or part of an elaborate system. A simple, inexpensive sticky note, map, wizard, reference card, poster or cheat sheet can be just as effective as pricier techniques. This book is chock full of fresh thinking and useful solutions." "Job Aids and Performance Support in the Workplace gives us everything we′ve ever wanted to know about these invaluable tools and techniques! Allison Rossett and Lisa Schafer have created a comprehensive, pragmatic, and very readable guide. The authors don′t exaggerate when they claim it′s ′knowledge everywhere.′ "
"Have you thought of city–wide Internet access as a service to citizens, like water, electricity, and trash collection? Well, why not? Once again, Allison Rossett has spoken in her practical and engaging way. She and Lisa Schafer made me think in new ways and remember why I got into the performance improvement business in the first place. Like every good teacher, Rossett somehow makes you feel you ′already knew it,′ and you are eager to get started anew." What Is Not Performance Support. What Is to Love About Job Aids? What Is to Love About Performance Support? Are We Forgetting Training and Development? 2 The When and Where of Performance Support. When to Use Performance Support. When Is Performance Support Inappropriate? 3 Performance Support Yesterday and Today. Job Aids at the Beginning. Performance Support at the Beginning. 4 Planner and Sidekick Performance Support. Integration, Tailoring, and Pizza Delivery. Integration, Tailoring, and Finding Your Way. Review of Chapter 4: Advising Amy, Alfonso, and Magnolia. 5 Examples of Planner Performance Support. 6 Examples of Sidekick Performance Support. Mike s Express Carwash Poster. Library of Congress Online Learning Center Demonstrations. 7 Getting Started with Performance Support. Consider Media and Technology Options. 8 The Elements of Effective Performance Support. The Look and Feel of Quality. IBM Brings It to Life. Eight Principles for Performance Support. You Don t Have to Be IBM. Place Performance Support in a Blend. Advance This New Way of Doing Business. Performance Support Is Not Magic. Still, a Very Good Thing.